A few months ago an experimental service to automatically find roads and other features in aerial imagery was launched. Today we’re adding to that a service to help improve local search results. The frontdoor app allows anyone on the web to help improve our address location results. 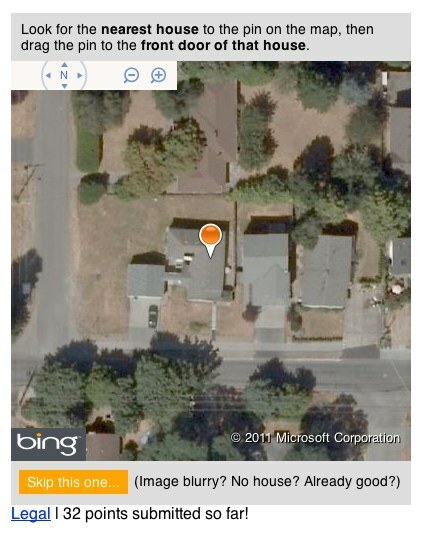 The site allows you to drag a pin from where we think an address currently is to the front door of the property. It works on a similar concept to Amazon’s Mechanical Turk. Only here the output is freely available OpenStreetMap (Or will be soon) address data. I’ve been working through Magicshop Frontdoor quite a bit this week so I know this is easy enough. Can’t be that many addresses in the USA, can there? The great thing about helping Microsoft here over lets say Google is that your efforts are helping the community at large. I wish other mapping companies would embrace this concept as Microsoft has (Wait, did I just call Microsoft a mapping company? ).